What I’m calling Chakat Professions are stand-alone stories that depict non-extraordinary events for a chakat in what might be considered an unusual or interesting job. The emphasis here is on the combination of chakat and the job, not the job itself. I make no claim of exclusivity to this category of story. 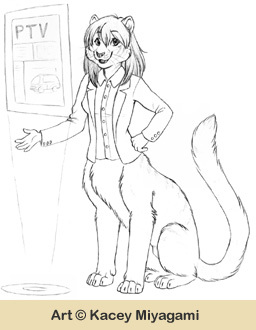 This story in particular is intended to not only depict the chakat/job combination, but also carry a lot of information about PTVs in the Chakat Universe. She was being stubborn again, so Justin came around and opened the door on her side. "We’re here, Mother," he said. She harrumphed and crossed her arms. "Don’t sulk, Mother, you heard the officer the same as I -- your truck is impounded." "Fool government," she finally said. "Takes a person’s property and transportation without so much as a word of apology." "They did apologize, but you were too angry to listen. And it’s still yours; you just can’t drive it in the city." "And since when is the Market inside the city?" "Since last year; I told you about it. Besides, it’s time you replaced that old thing." She continued complaining, but she did climb out. "It’s done fine for our family." "It’s an antique; it runs on volatiles." "Nothing wrong with that. So do we." "Yes, but our ‘fuel’ comes from farming, not a still that you keep patched together." "That still’s not given me half the trouble the fool government has." She stopped, glaring at the overhead sign: "Christos of Longreach -- Queensland’s Highest-Rated PTV Sales and Service Center." Justin sighed. He’d almost gotten her through the doors. "What is it now?" "I don’t like salespeople, especially car salespeople." "It’s not like that, Mother." "I’ve warned you before; the only thing they care about is what they can get you to pay for." "Rivertrip? That sounds like a chakat name." "Shi is a chakat, Mother, and shi’s inside. Shi’s also expecting us." "Because I called hir from the police station. Now can we go inside? Please?" "Don’t expect me to agree to anything," she said as she opened the door for herself. The interior of the dealership was decorated in an understated yet stylish tan-gold color scheme. Mostly a single, large room, a series of translucent partitions stretched along one wall to give the staff a little privacy, but the majority of the space held a half dozen PTVs and other small vehicles in a loose circle about a large, seemingly decorative disk in the mottled gray floor. Music -- another instrumental piece that sounded classical but that Justin could never identify -- played softly from concealed speakers. Only seconds after the door had closed, a ginger-coated chakat wearing a brown jacket unbuttoned over a white top came out of the cubicles and approached them. "Justin!" shi said, smiling, "you’re earlier than I expected. And this must be your mother." "Alexandra, my dear," she said, holding out her arms for a hug. "But you can call me Lexis." As shi proceeded with the ‘traditional’ chakat greeting, shi introduced hirself. "And I’m Chakat Rivertrip, daughter of Greentree and Naturetrail." Mother responded to the look Justin gave her by saying, "I haven’t lived in Australia all my life without learning how to greet a chakat." "And you, too, Justin," said Rivertrip as she gestured for him to step closer for his own greeting. "I was thinking I’d have to wait until Adalwolf began shipping their new seat design to see you again. Now, let’s get comfortable." As Rivertrip led them to a small conversation cluster in the corner, Mother insisted, "I just want to warn you, I’m not in the market for a new vehicle." "That’s all right, Lexis," said Rivertrip, "I just want to make sure you have what you need." "The ‘soft sell,’ is it?" "Soft -- oh. Let me guess; you’ve been reading ‘Motor Town.’"
"Yes, and I know all the tricks you salespeople use." Rivertrip’s laugh was as musical as flowing water. "Lexis, I’m happy to say that sort of nonsense was a casualty of the Gene Wars. Both the stereotypical car salesman and most of the car culture exists only in novels like ‘Motor Town’; usually in the bad kind. I would no more ask you to buy something you don’t want than I’d suggest you change your faith, not to mention it would get me fired and possibly arrested." "I’ll believe it when I see it." "Tea? Well, I hope it won’t take long. Justin?" "Yes, thank you," he said, taking the proffered cup. "And you?" said Mother, looking at him. "You’re the one who dragged me in here." "Mother, all I ask is that you give Rivertrip a chance. If after that you still want your old truck, I’ll see what I can do about getting it back for you." "I hope you don’t," said Rivertrip. "Internal combustion vehicles are rarities these days; I know of at least two collectors who would probably bid against each other for a Banesworth pickup like yours. Justin told me what happened." Lexis made a face. "Sell my truck to a collector so you can sell me something twice as pricey, I suppose. I don’t need all those fancy gee-gaws Justin has." "I can’t imagine you would. Why don’t you tell me what you do need?" It seemed to Justin that Mother was going to not answer Rivertrip out of spite or maybe some notion that the salesfur would try to use that knowledge against her, so he spoke up in her place. "Mother lives on a small sheep station in the Outback. It’s been in the family since the Gene Wars, just like the truck." "That explains a lot," said Rivertrip. "People these days can’t let a body alone," Mother complained. "This is just another attempt to get me to move into the city." Justin shook his head. "Mother, I only suggested that once." "It’s my land -- it’d be our land if you had a lick of sense -- and I’m not leaving it." It was an old argument. Mother had been one of four children and the only one who had stayed with the land. Uncle Clarence had died a bachelor while on duty in Star Fleet, Aunt Beatrice had married and moved to England, and Uncle Dunstan had joined the original colonization effort for Chakona. With Justin her only child, and him having only two children of his own, Mother was worried about what a ‘stranger’ would do if they inherited the station. Justin looked at Rivertrip for help, but the chakat seemed to be trying not to laugh. "There’s no reason you should leave," shi said, keeping her teacup near her mouth for a quick sip, "but you’re going to want something to help." "I don’t need any hands, if that’s what you’re suggesting," said Mother testily. "No, but you have to admit that you couldn’t have managed without your truck." "Of course, it must be getting harder to keep it running." "Never has been easy, but I’ve got all the tools for fixing it." "Got a still I use to make alcohol from cuttings and such." "Too much trouble to keep updated." "Cargo, but not too many passengers." "Tell me, Lexis, how much do you know about PTVs?" "It’s just another word for a car." Rivertrip set down her teacup. "Not really. It does stand for Personal Transport Vehicle, and they have supplanted cars for almost everything, but calling a PTV a car would be like calling a starship a rocket." "Fancy gadgets give more chances for things to break. The Outback doesn’t play nice." "And there are PTVs that can play just as rough. The Environmental Monitoring teams swear by theirs." "Okay, if I don’t know enough about PTVs, why don’t you tell me?" Rivertrip smiled. "All right. First of all, PTVs got their start as a design for a ground transport for the military during the latter part of the Gene Wars. It wasn’t adopted, so the developer went looking for an alternate market. That’s when they discovered that they’d created something special." "Not anymore, but the demands of the battlefield meant that the original PTVs were wonderfully rugged and very easy to operate. With independent drives for each wheel, they could continue moving even with only one running, and once all the unneeded military add-ons like armor were removed, it could reach a very useful speed." "Sort of like the old Jeeps." "Except that the PTV wasn’t just borrowed from the military, it was redesigned. The communications unit that had been originally intended for use in a battle command network was replaced with one that ‘talked’ with other PTVs so they could share the road and avoid collisions. The AI was reprogrammed for a civilian environment, and a larger power core allowed an increased range. But mostly they had their bodies and interiors replaced for comfort and safety. Since then, both competition and our changing world have prompted other improvements, such as the coordinator zones." "Don’t mention those monstrosities! That’s what got all this started." "Mother, please," said Justin. "If it weren’t for the coordinators we’d have accidents all the time. There are a lot more vehicles in the city than there are in the Outback." "Different tastes, Lexis," Rivertrip said. "Or would you want everyone to move to the Outback?" "Heh, you got me there. It’s just annoying that they won’t let me drive to the market anymore." "Fennimore’s Market on the west side," explained Justin. "It was brought into the Coordination Zone last year when the city annexed Ridgeway." Rivertrip nodded. "And special licenses are required to operate a vehicle without using the Coordinator inside a Zone. Well -- I think I know the kinds of things you need, Lexis, will you look at a PTV?" "I’ll look, just don’t expect me to buy," she said. "I’m not going to let you buy unless I think you understand what you’re getting. As I said, the days of the slick car salesman are long gone." As the trio walked out into the showroom, Mother said, "I am not getting one of those." "I’d be very disappointed if you did. That’s a Morgan Land Yacht 220 with the large group package. Even with the cargo package, it’s much too big for your needs. What you want is something a little more rugged, with a power source that doesn't have to come into town every week for fuel." "I thought PTVs were all electric, like Justin’s toy out there." "Mother, I use that for business, too." "The drives are electric, but even with most of the population concentrated in cities, there’s still a need for vehicles that can operate independently for long periods," Rivertrip explained. "There’s a variety of power cores available, just as there are several sizes and feature sets. For you, though, I think a Corwin Basic would be the best fit." "You said you sold Morgans." "I sell PTVs, Lexis. Dealerships aren’t brand-exclusive anymore; I’m free to match you to the exact unit you need. I can even arrange to have it customized if you want." "No fancy paint job for me." "Nothing like that, but what about a food and water locker, or maybe a fold-out bed for staying overnight away from the house? If it's in the Outback, I can’t imagine your station is small enough for you to drive home every day." Mother harrumphed. "Maybe. Show me this ‘Corwin’. It’s the current year’s model?" "Yearly models were car ‘fashion’; PTVs don’t go out of production so often. This is a Corwin Basic with the family package, suitable for the transportation needs of a household of six. For you, though, I’d recommend the labor package with independent options." As shi turned to the large circle on the floor that the display vehicles surrounded, a control panel descended from the ceiling. Rivertrip tapped a few times, bringing up a hologram of a PTV in the circle which shi proceeded to modify as shi talked. "The labor package replaces most of the seating with a cargo area; it also beefs up the suspension and drives. That also gets rid of the four-wheel steering, but you won’t be asking yours to crab-walk into a parking space. Adding the independent options will give you several power core choices, small lockers for equipment, food, or anything else, as well as that fold-out cot and an expanded communication set. Did you have a radio in your truck?" "Yes, but it never could reach very far." "Well this one can. In addition to cooperating with Control Zones and other PTVs, it can tie into the satellite network and keep you updated about weather and other news, or call for help if you’re stranded." "And argue with me I expect. I don’t like how Justin’s PTV yammers." "Justin got a secretarial personality package with ‘full voice’ for his AI; you don’t need that, or at least not that one. Most people don’t want to be reminded how smart their PTV is, so they don’t have it talk at all. But if you change your mind later, it’s easy to switch over. Here," and Rivertrip caused most of the holographic image to go transparent, "these are the AI units." "As in more than one?" "That’s how AIs are designed. If one of the units goes bad, it’s overridden until it can be swapped out for a replacement and taught by the others. The redundancy is a fail-safe for something we give so much authority to. From the outside, we don’t even see the separation. Lexis, is something wrong?" "I guess I didn’t realize that AIs actually think." "Oh, no, they don’t. They learn, but they don’t actually think. A PTV’s AI keeps track of its systems, monitors its environment, and learns how its operators like to drive, but they’re not going to start writing poetry or suggest a place to eat. If you added a personality package and started paying for the right services, it might be able to keep you entertained, but AIs aren’t alive by any stretch of the imagination. They can only do what they’re programmed to do." "That’s good to know. So this is what you want to sell me?" "With a few more touches, I think it will fit your needs. Let’s see." Rivertrip scrolled through various menus, tweaking the projection as she made adjustments to the package. "Roark's model 555 power core will give you at least five years of use and a reserve cell for when you need a little more oomph; it's more expensive, but you won't run the risk of going dry like you did with alcohol fuel. They also offer a good unit replacement program when it does start to fade. Environmental Monitoring uses them, which I always consider a plus. Add a full maintenance library for self-service, more ground clearance, and would you want an adaptive passenger seat? 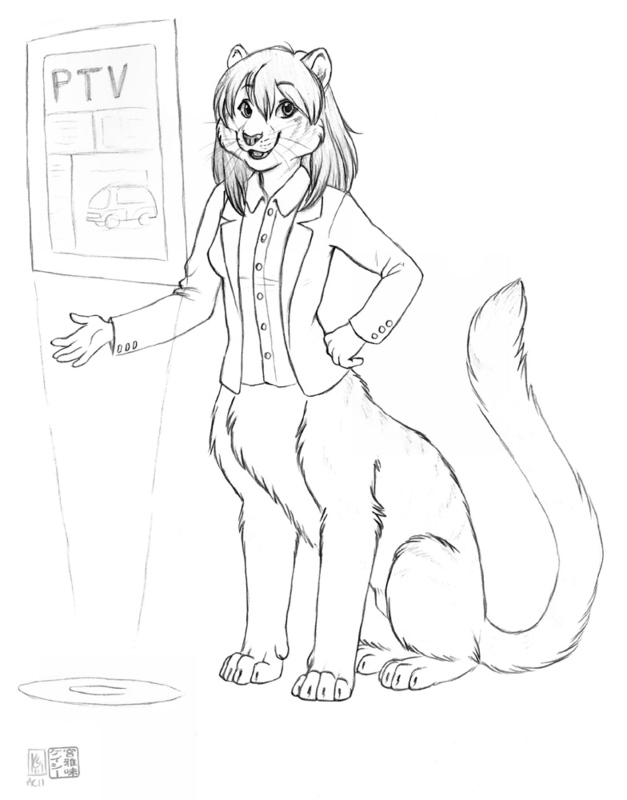 It’s not as comfortable as one of the species-specific designs, but it can be adjusted to suit anything from a chakat to a mouse morph." "I’ve got a chair like that at home for visitors." "I’ll include it, but we can exchange it for something else just as easily." "And if I don’t like it, you’ll charge me an arm and a leg to replace it," Mother said with a grimace. "The Basic is a standard modular design; if your needs change or something doesn’t work right, we can swap modules out until your happy." "A small one; it’s less than buying the modules, and there’s an exchange network for modules, so you’ll save there, too. Or I can put you in touch with a customizer if you need something unusual." "Those are standard modules, actually. Also tailed seating, alternatives for small and large drivers and passengers, towing packages, breakdown packages, firefighting, law enforcement, deliveries, mobile office, several workshop sets…" As Rivertrip spoke, shi ran the hologram through examples of the features shi mentioned. "All that from just one PTV?" "We’ve come a long way from the day when you had to custom-order from the factory. In fact, if we pick the right modules, you can swap them out yourself. You should see what a movie studio can do to their rigs. Some of them have been in more movies than an actor under contract!" "So… how much would this cost me?" The chakat saved her construct and sent the panel back into the ceiling. "Let’s sit down again. As I said, I know of at least two collectors who would be interested in a running internal combustion truck; Justin said it’s a Banesworth pickup. They’d probably pay you enough -- even deducting the impound fees -- for one of those to not only cover the PTV and packages…"
Thank you for your help in buying my PTV. It’s been doing as good a job as my old truck, but I wanted to write and tell you about something that happened that made me very glad I took your advice. As you know, last week we had those thunderstorms come through. I don’t know what they are like in the city, but out here they move all the loose stuff about and make quite a mess, so the day after I was out clearing my trails and ditches of fallen limbs and such. I’ve done it before and usually don’t have a problem, but every once in a while there’s a tangle that doesn’t want to cooperate. This time I got surprised and got my fool leg broken. Don’t get worried, I’m a tough old bird and I’m okay; I’ve had this happen before. The thing is, after I dragged myself back to the PTV and put on a splint, I was all worn out so I put down the cot to rest before trying to drive back. I was mighty surprised to wake up in a hospital. It seems the independence package you gave me includes a few special bits for the AI, and when it decided I was hurt and not moving, it asked for help and got told to bring me in. And when I got released, it was waiting there to take me home. I may not use a lot of fancy gee-gaws like my son Justin, but I’m dang grateful for doctors. My PTV saved me a lot of trouble getting to them. I’m home now, and I’ll be right as rain in a couple more days thanks to you. Next week I’ll stop by while I’m in town on errands and thank you proper. "Adding to your scrapbook?" James asked. Rivertrip smiled at her coworker. "A good salesperson’s best reward is a happy customer." "In that case pick up line two." "Thanks, James. Margaret! How do the kits like the new seats…?"